Ramayana is a revered scripture of the Hindus worldwide. Various versions exist, depending on who wrote it and when. Tulsidasji’s Ramcharitramanas is also different from Valmiki Ramayana. Modern authors have given their own twist to this great story of Lord Ram and Lady Sita. 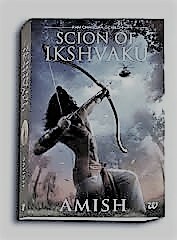 Amish’s book “Scion Of kshvaku” is based on this great hindu epic. The central characters and plot is the same but the story has been modified to appeal to current audiences. The book starts with the battle of Karachapa, between Raavan and King Dashrath of Ayodhya. Raavan started as the head of trading security force of Lanka, rapidly rising to the post of army chief. He has now become very powerful and has imposed his trade practices on several states of the Sapt Sindhu, the Indian heartland. Kubaer, the king of Lanka, at the behest of Raavan unilaterally reduces the comissions that were Ayodhya’s due. Dashrath does not take kindly to this and announces an attack on Lanka. In his anger and over-confidence he loses the battle, which Raavan wins due to his intelligent strategy and warfare techniques. Meanwhile, Dashrath has three wives: Kaushalya, Kaikeyi and Sumitra but none of them bear him an heir. The same year that Dashrath loses the battle of Karachapa, a son is born to Kaushalaya, Ram Chandra. Ram lives a bitter childhood, ostracized and cursed for the loss of Karachapa. Seven months later Bharat is born to Kaikeyi, Dashrath’s favourite wife.And subsequently Sumitra gives birth to twin boys: Lakshman and Shatrughan. The boys move to Guru Vashishtha’s ashram for their education. When the boys finish their education, they come back to Ayodhya. Bharat, being the king’s favourite is made in charge of Foreign Affairs and Ram being under-praised, is handed over the police department. Law and Order has degenerated in Ayodhya since the battle of Karachapa, which had taken a toll on Dashrath, both physically and mentally and he was no longer the great king that he used to be. Ram brings about various reforms in the police department and as such law and order situation improves in Ayodhya. One day Dashrath announces that he is going for a hunt, Ram and Lakshman accompany him. On the hunt, Ram risks his own life to saves Dashrath, who comes to realize his mistake, he comes closer to Ram and appoints him as the Crown prince. One day Guru Vishwamitra, comes to Ayodhya asking Dashrath for help against demons. Dashrath unwillingly sends Ram and Lakshman with him. Ram and Lakshman help to secure Guru Vishwamitra’s ashram and subsequently he takes them to Mithila, where princess Sita’s swayamvar is being organized.Ram wins the Swayamvar and marries Sita, Lakshman marries Urmila . The two princes and princesses plan to return to Ayodhya but Raavan attacks Mithila. Ram is forced to use Brahmaastra in the battle to save the state of Mithila.He decides to penance himself. On returning to Ayodhya, Ram tells Dashrath his decision to self-exile for 14 years. Dashrath does not agree to it. Meanwhile Kaikeyi goes into koap-bhawan and demand the king to return her the two boons that Dashrath had granted her after she saved his life in the battle of Karchapa. She demands that for the first boon, Bharat be crowned the king of Ayodhya and for the second boon, Ram be sent to exile for 14 years. Dashrath has no choice but to agree. Ram, Sita and Lakshman proceed to their exile. The story ends with Raavan kidnapping Sita from the Dandakaaranya. The book keeps you glued even though it is based on Ramayana that every Indian has read or seen multiple times on TV. It’s a real page-turner and you impatiently wait for the second part to be in my book shelf. Amish weaves a spell with this one.It is quite fast-paced and even the mundane details of battle do not bore you.